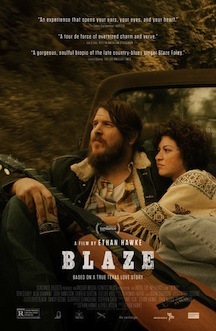 Better known as an actor, Ethan Hawke decided not to star in Blaze, a film he directed and co-wrote about the American country singer-songwriter Blaze Foley. Hawke may not make all perfect choices in this well-intended adaptation of Blaze’s ex-wife memoir, particularly in terms of duration and dynamics. However, he succeeds in enveloping the viewer with that same digressive sarcasm and melancholic torpor that got the musician, an alcohol-drenched, ZZ Top-like bearded man who died at the young age of 39. He once affirmed: “I don’t want to be a star. I want to be a legend". Real-life musician Ben Dickey played the character adeptly, in what was his first acting role. On the gnarling inaugural scene, probably the most vivid of the film, a wasted Blaze and his junkie friend, the folk singer Townes Van Zandt (Charlie Sexton), drive a studio manager crazy. Blaze’s story, then unfolds as Van Zandt and Zee (Josh Hamilton), another musician, give an interview about the former's latest album. The flashbacks, filtered with yellowish monochromatic warmth, show the ups and downs of the long relationship with his supportive Jewish lover, Sybil Rosen (Alia Shawkat), who would become his wife. After enduring disenchantment associated with Blaze’s drinking problem, she was forced to move on, leaving him in a pitiful state of decadence, playing songs about his life experiences for indifferent people in small, nearly empty southern pubs. Capturing the emotional subterfuges of an artist you’ve probably never heard of, the film never felt less than thoroughly lived-in by a cast that was permanently in the care of making this small work a bigger achievement. It’s a lengthy, inebriating, and casually funny experience that didn’t fall into the usual traps of biographical films.